The Japanese love their lucky charms. I don't know anyone here show doesn't have a good luck charm or talisman for something. Most of these are omamori, various little cloth packets with lucky phrases sewn on, bought at Shinto shrines. But at Buddhist temples you are more likely to find daruma. These adorably squat, red, round and wooden or papier-mâché, and are sold with either no blacks in their eyes or only the left one filled with black. When you make a wish or goal (like to win an election or to pass an exam) you fill in the first eye and then the second (right) eye when you achieve your goal. Little Daruma in this story comes with both eyes filled in, but that doesn't stop him from wishing! He wants everything his friend Little Tengu has; geta sandals, leaf fan, funny hat, and even his long nose. Little Daruma covets a lot which is interesting as Buddhism teaches that greed is bad, but desires that spur you to achieve goals are good. That's a fine line, but I don't think that Little Daruma crosses it as these desires that push him towards creativity. Instead of choosing a from a myriad of hats, fans, and shoes offered by his father, he finds creative ways to make the items he wants of Little Tengu's. Kids do covet things, no matter how much we wish they don't! I guess that's why there are so many commercials targeting kids. This is a great book for getting kids talking about what they envy about other people and to figure out how they can get them. It turns out my son wants more Valentine's Day chocolate from girls in his class, so we brainstormed ways to be nicer to his friends. Nothing like a little roundabout bribery! What I enjoyed about this most was seeing how they dealt with a Japanese joke that involved punning around the word hana, which means both nose and flower. I think the translator did a great job, just adding in a one sentence explanation the first time the word arose, and let kids figure it out from there. 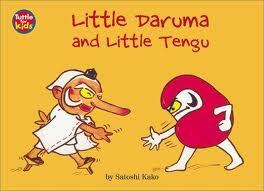 On the cover Little Daruma and Little Tengu are playing rock, paper, scissors. I think it would be great fun to include the Japanese version of this in a read aloud session of this book. Japanese people make a fist and say "Saisho gu" (first is the rock) "Jankenpon" and then stick out their chosen hand shape. "Gu" is rock, "choki" is scissors, and "pa" is paper. This is a great little book that introduces two characters that play a big role in Japanese superstitions. It is part of a series of Little Daruma books that all introduce different Japanese legends. The Japanese version is available here. I really want to teach Xander about other cultures, particularly Japanese since I'm so fond of it. I actually bought an omamori for pregnancy from the Meiji shrine just before I became pregnant and kept it in my purse the whole nine months. I even took it to the hospital and held it during labor - I had to explain it to the nurses and midwives. I've kept it so I can show it to him when he's a little older. I'd love to return to Japan and buy him a daruma. I love that you taught your son being nicer to his friends might get him more chocolate next year. I hope he didn't forget White Day for the chocolates he did get! Eeep! That's steep. That's 4 other books... I'd say if there is one Japanese-ish book you need to get it's Sora and the Cloud. So glad I got this at the library. Its English section is sparse but it is good for something. I do hope you can return here someday, it would be great to take your son, as I bet you both see totally different Japans. Can't say I'm surprised to hear about boys forgetting white day. Unless the stores promote it virrulently enough they'd forget Valentines day over here. I bet he would see an even more magical Japan than I did. My husband and I are trying to make plans for a couple of years from now, when our son would be old enough to remember for most of his life. I'll have to look-up 'Sora the Cloud', hopefully its in a more affordable price range.